Just load an audio file and you’ve got the chords. It’s that easy! With Chord Pickout, guitar and piano players can get chords to popular songs right away. Just download a tune and save it into a WAV, MP3 or other supported file, load it into Chord Pickout, sit back and relax. 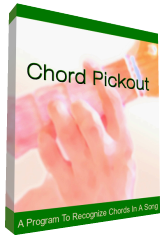 Chord Pickout uses all the power of artificial intelligence to pick out the chords for you, transcribing the music and producing a printable and editable score. All that is completely automatic. Its powerful editing capabilities allow modifying and printing scores and lyrics. Please note: The software provides a 1-Year license.